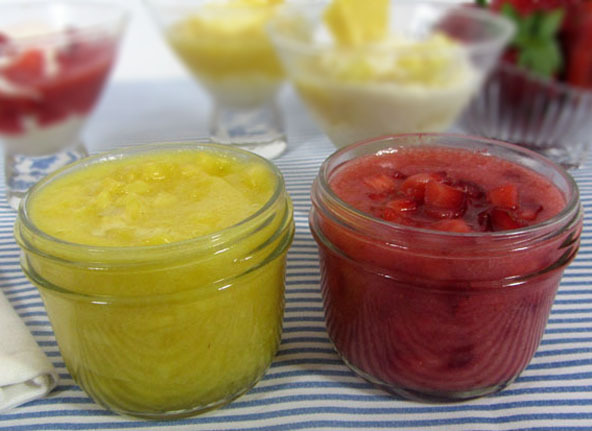 I’m calling this “Over the Rainbow Sauce” because it can be made from a rainbow of colorful fruits and served over just about any dessert. It’s great on banana splits, cheesecakes, muffins, yogurt and don’t forget Wholetarian pancakes and waffles. Start with the chia seeds. Put a Tbsp of chia seeds into a small coffee grinder (not used for coffee). Blend into a powder. Put all the ingredients into the blender except for the chopped fruit and stevia. Blend until it's the consistency you want. Do a taste test and add the stevia or sweetener of choice if you think it needs it or blend in additional fruit if desired. Stir in the chopped fruit if using. Use at room temperature or cold if desired or warm it up over low heat in a pan on the stove. Store in a glass jar or container with a lid in the refrigerator for about a week. 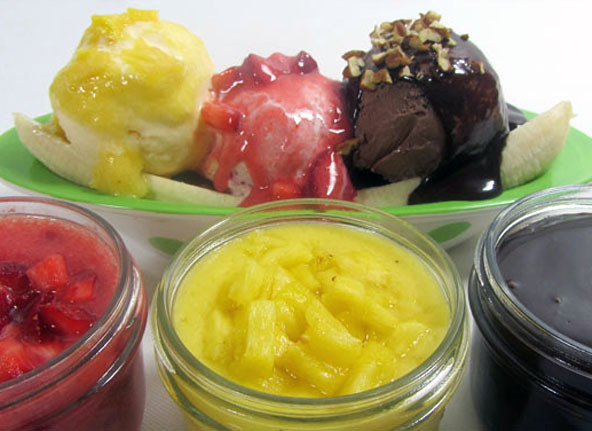 Create your own variations of “Over the Rainbow” Strawberry and Pineapple Sauce and even Karly’s Chocolate Sauce.